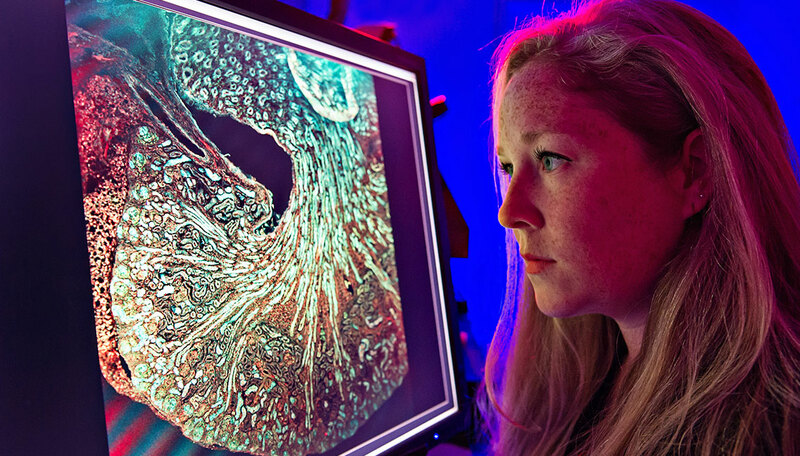 BioArtography blends science and art, showcasing beauty at the microscopic level. There are hints of abstract expressionism: the way the colors seem to move, the way they bleed together and blend out. The brilliant blues and purples, paired with fluid, organic shapes, evoke post-impressionism. You could see de Kooning’s emphatic strokes here, or the bold, heavy lines of Pollock’s early years. But you’d be wrong. At left is a slide from a basic science lab. The subject is not intended to be emotive — it’s not intended to be anything other than what it really is: mucus, dyed and stained. Heather Schofield, an M.D./Ph.D. candidate in the Cellular and Molecular Biology Program, collected the image from a mouse model while conducting pancreatic cancer research. “Watercolors,” as she titled it, depicts how invasive tumors can cause blockages in nearby tissues, resulting in buildups of food and other material. It’s unsettling, but undeniably beautiful. And it quickly became a crowd-favorite at the 2017 Ann Arbor Art Fair’s BioArtography booth. This reimagining of the artistic process is what led Deb Gumucio (Ph.D. 1986), the James Douglas Engel Collegiate Professor of Cell and Developmental Biology, to found the BioArtography program in 2005, along with K. Sue O’Shea, Ph.D., the Crosby-Kahn Collegiate Professor of Cell and Developmental Biology, and Kim-Chew Lim, Ph.D., associate research scientist in cell and developmental biology. Chemical dyes and antibodies turn previously transparent slides into effervescent explosions of color, shape, and form. As an organogenesis researcher, Gumucio became an expert at rendering such images, but she always thought they deserved a larger audience than those select few working in labs. And so the program, based in the Department of Cell and Developmental Biology, was born. Its beginnings were humble, consisting of a few hand-picked slides that Gumucio had matted and framed. But now, in its 12th year, the program is a fixture of the Ann Arbor Art Fair, and has garnered press both local and national. The current collection boasts more than 200 pieces, a large portion of which feature tongue-in-cheek titles such as “A BeautiFLY Mind” (for a fruit fly brain), “Circuit City” (mouse neurons), and “Cooties” (the Staphylococcus aureus bacterium). Each image is paired with a short description written by the researchers, providing context and clarity. All of the proceeds go directly to trainees, in the form of conference registration, travel, accommodations, and more. It’s something Gumucio heralds and wants to guarantee for years to come: a fully supportive model that enriches both scientist and art enthusiast. Not to be forgotten, too, is the important role that such a program plays in public science and health education. BioArtography is currently run by Gumucio and Santiago Schnell, D.Phil., interim chair of the Department of Molecular and Integrative Physiology, and professor of computational medicine and bioinformatics. Purchase the pieces at BioArtography.com, or support the program through the Friends of BioArt fund.